Raymarine's RV-220 Bronze Thru-Hull Transducer is designed for vessels with a deadrise from 13°-20° and works with both inboard or outboard engines. View Structure and Locate fish with extreme clarity. The RV-220 is a 4-Channel CHIRP, Wide Spectrum Transducer with DownVision, SideVision and RealVision 3D and ensures full 180° underwater coverage. The RV220 System pack includes a pair of transducers. 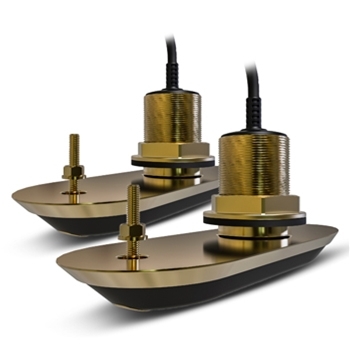 Both Rugged cast-bronze, these transducers can be used on both fiberglass and wooden hulls. While one transducer transmits port and downwards, the other transmits starboard and downwards. A low profile design enables the transducer to slide through the water effortlessly without drag or cavitation and works great for trailer boats. A built-in AHRS system (attiude and heading reference) stablizes your sonar image and automatically compensates for vessel movement providing crystal clear images even in waves, swells and while moving! The Built-In temp sensor provides quick and accurate readings confirming that the RV-220 Transducer is a must have for Axiom RV and Axiom PRO RVX Models! Each Raymarine RV-220 RealVision 3D Transducer comes with: Raymarine RV-220P Bronze Port Transducer with 2M Cable, Raymarine RV-220S Bronze Starboard Transducer with 2M Cable,RealVision 3D Y-Cable, RealVision 3D 8-Meter Transducer Extension Cable, Anti-Rotation Bolt Kit, Installation Instructions and a 2-Year Warranty.